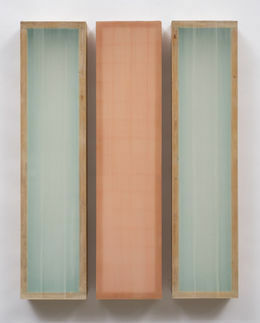 Since her debut in 1989 at the Bess Cutler Gallery in New York, Hutchison’s visual line of inquiry into light and transparency has led to multiple solo and group exhibitions, most recently with Margaret Thatcher Projects. Heather is the recipient of a 2012 Pollock Krasner Grant and a 2011 Adolph and Esther Gottlieb Foundation Individual Artist Grant. Her work has been exhibited in the Corcoran Biennial, Brooklyn Museum, Otis College of Art and Design, Knoxville Museum of Art and the Montclair Art Museum. Select public collections housing include the Hammer Museum, Brooklyn Museum, the Smithsonian, Harvard University and Art in Embassies, Beijing, China.